In the south-west corner of the state of Saxony sits the Vogtlandkreis, nestled in the low mountains of the Erzgebirge. 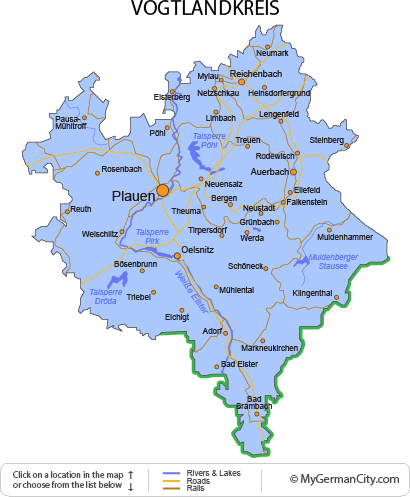 To the west of the main Ore Mountains, this region still holds it’s snow in winter and is on the border of both Bavaria and Thuringia in Germany, and the Czech Republic. Don’t miss the winter sport haven and music town of Klingenthal, sitting right in the Vogtland at the border to the Check Replublic and attracting ski jump world cup fans from all over. Vogtlandkreis is still a center for instrument making with brass and strings as it’s specialty and there are many museums to testify to their long history of doing so. It is also famed for it’s clothes-making, mother-of-pearl industry, wonderful castles and numerous spa clinics. It even claims to have mined the topaz found in one of Queen Elizabeth II’s crown!